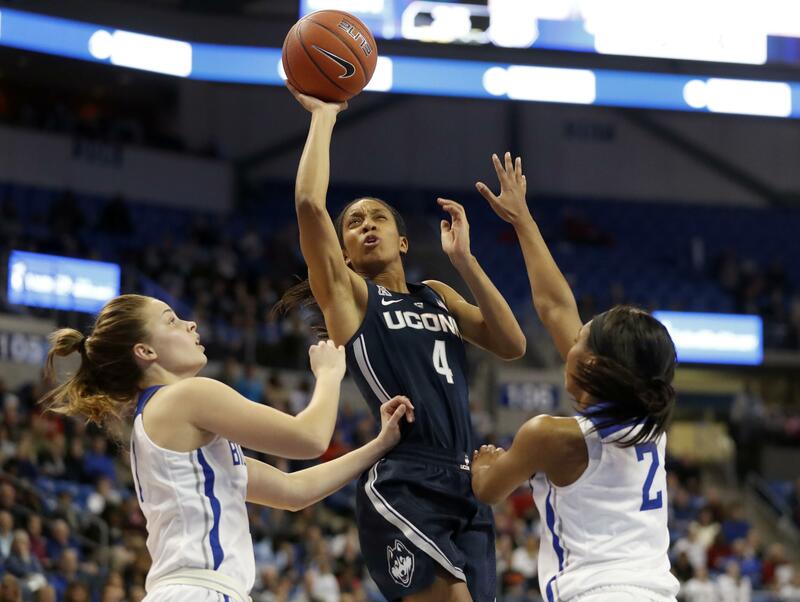 Tue., Dec. 4, 2018, 6:22 p.m.
ST. LOUIS – Napheesa Collier had 22 points and 11 rebounds, Katie Lou Samuelson scored 20 points and top-ranked UConn beat Saint Louis 98-42 on Tuesday night. The Huskies (8-0) have won 123 consecutive regular season games. Crystal Dangerfield added 18 points, and Christyn Williams had 17. Myia Clark led Saint Louis (4-5) with 18 points. UConn rolled to a 15-2 lead and never looked back. Samuelson propelled the early outburst with a pair of 3-pointers, and Collier had a short jumper. Williams hit a 3-pointer with less than a minute to go in the first quarter to push the lead to 23-8. LOUISVILLE, Ky. – Asia Durr scored 25 points, Arica Carter had 16 and Louisville’s defense stifled UT Martin. Durr provided Louisville’s initial boost with 16 first-half points, while Carter added 12. The margin quickly reached 40 in the third quarter as the Cardinals (9-0) hit the century mark for the second game in a row. Sam Fuehring had 10 rebounds and nine points, Bionca Dunham scored 14 and Dana Evans 11 as Louisville improved to 8-0 against UT Martin (5-3). Chelsea Perry had 12 points and eight rebounds for UT Martin, which had won two of three coming in. DES MOINES, Iowa – Becca Hittner scored 23 points to lead Drake. Sara Rhine had 22 points, making all 10 of her shots for Drake (8-1). A record crowd of 6,031 at the Knapp Center was on hand for the annual game for elementary and middle school students. Tina Ubl led Clarke (7-3) with 14 points and Makenna Haase added 12 points, 13 rebounds and two blocks. Published: Dec. 4, 2018, 6:22 p.m.